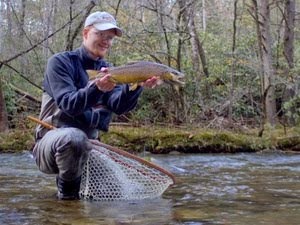 The longing for pristine wilderness and an untouched trout stream is probably common to many fly fisherman. I have hiked up and down mountains for miles in a day searching for the perfect stream. I read whatever fly fishing literature I can get my hands on in hopes of some subtle clue. Pouring over topo maps will scratch the itch to explore, but only enough to make it worse. A small stream in Southeast Tennessee has been begging me to try it out for awhile now. I have been in the vicinity several times and just hadn't stopped to fish it yet. This weekend I decided I was going to check it out. I arrived at the stream in the early afternoon and was very concerned at first. As I drove along the creek, the streambed was bone dry. However, it became apparent after I arrived at the trailhead that the stream must flow underground because I could hear water. Sure enough, the creek had enough water to keep the fish happy and healthy. So I grabbed my flyrod and started walking upstream. I had not gone very far before my curiosity got the best of me and I tied on a parachute Adams and started casting. The stream was really small so bow and arrow and roll casts were generally the method of operation. 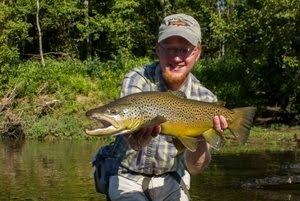 I worked upstream and began getting hits. The fish were really spooky and the water was pretty low so I had to go into stealth mode before I actually hooked up. 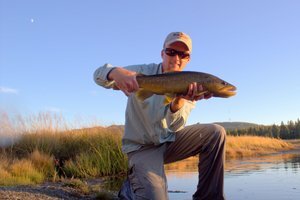 After a couple of small fish, I started to think that maybe the fly was a bit too large so I tied on a small cream softhackle and it was just the ticket. The rainbows would hit it just about anywhere in the stream but I had to be paying very close attention to notice the takes. 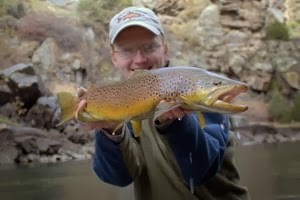 I was fishing the softhackle upstream and without any kind of weight so the takes were very subtle most of the time. While the day was overall a lot of fun, I probably won't be making trips just to fish this stream. I caught somewhere around 10 fish and worked for each one. 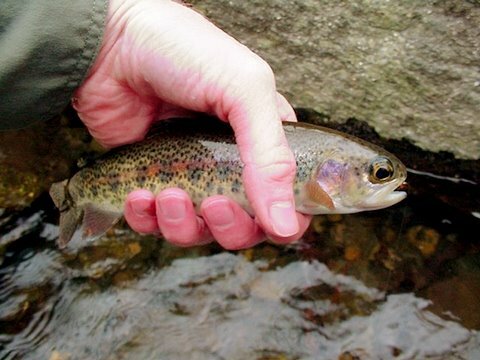 The largest fish I saw all day was probably 8 inches and they were all rainbows. Exploring is hard to beat though and I don't consider my day on the water a waste. Someday, somewhere, I WILL find that water that gets fished by only a few people every year where the fish are practically begging me to catch them. However, until I find that stream, the challenge of finding it will keep me checking out these small streams. Eventually, I will find a hidden gem! Good to have stumbled across your blog. You can check mine out at amcnulty11.blogspot.com. 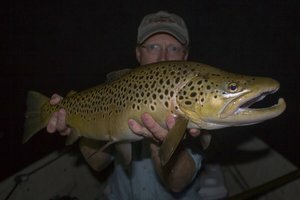 It is good to hear the stories of your fishing experiences. Hopefully we can do a campting trip this fall. Hope all is well.